A £440,000 extension to the Sunshine Centre in Bretch Hill to provide more space for outreach and advice services has been announced today (Tuesday, March 26). Preparatory works on site are currently underway ahead of builders getting on site on early June with construction scheduled to last 24 weeks. The funding comprises £320,000 of Section 106 funding, contributions secured from the developers of the nearby Bloor Homes development, and £120,000 of capital funding from Cherwell District Council. John Bridgeman, chairman of the centre’s board of trustees, said: “We have long been determined that Banbury’s independent Sunshine Centre should be expanded not run down. “Working with a wonderful team of professionals at the centre we can now look forward to enlarging both the scope and the scale of our support. The district council has appointed Tackley-based contractors Wooldridge and Simpson to undertake the building work while the extension has been designed by TSH Architects, based in Oxford. Nicola Riley, the council’s assistant director for wellbeing, said: “The Sunshine Centre runs everything from stay and play to antenatal classes, and support for survivors of domestic abuse. “Their award-winning work helps Banbury parents and children reach their potential so it goes without saying that we are delighted to be helping them take their next step forward. Last year, the centre was recognised as the ‘best group’ in Cherwell at the Oxfordshire Charity and Volunteer Awards. It is also the only early years service in Oxfordshire to hold an ‘outstanding’ rating for ‘looked after children’ and ‘children on the edge of care’. 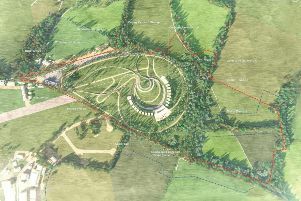 The Sunshine Centre also collaborates with Cherwell on projects such as Summerfest, and the recent Winter Wishes consultation, which asked residents for their aspirations for Bretch Hill.